Balancing On My Toes: A Beautiful Scrapbook Organization Station! No guesses? Well I guess I'll just have to show you! This baby was on sale at Michaels for 50% off and I had been eyeing it for some time! In fact my mom and I both bought them, each of us ended up spending about $40 on these babies, including donations that we made to students who need back to school supplies. 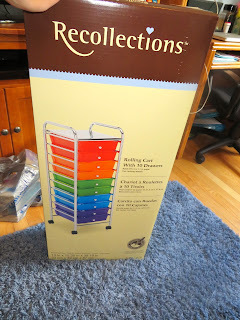 It was a great deal, and I figured it would be a great place to put all my scrapbooking supplies. Once I got home, I started putting this bad boy together. I have to tell you that my mom and I got a little competitive to see who could finish putting theirs together first. There weren't a ton of pieces and luckily I'm pretty mechanically-oriented and don't have too much trouble putting things together. So excited, and by the way, I won. Even though once I finished and offered my mom help finishing hers, she rudely declined and said that we weren't racing to begin with. Whatever, I'm a little competitive I suppose...and I finished first. Once it was together, it was time to start organizing. 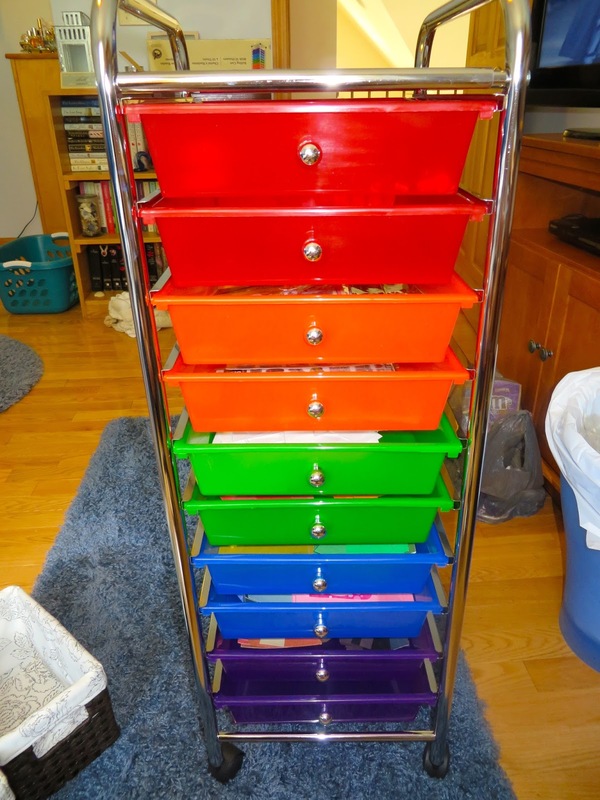 I had three bins as my organization system previously. One for stickers, one for scrap papers, and one for all my pictures and things to scrap. I wanted to definitely get the paper organized in this container. All my scrap paper was inside one bin and it was getting rather annoying. Each time I scrapbooked I would just toss the scraps back in the bin. 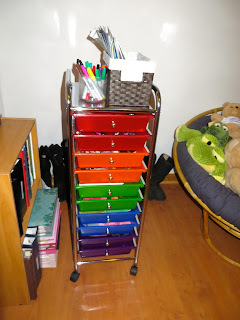 Even if I attempted to organize them by colors they would never stay that way. It was just plain annoying. Finally, after quite a bit of sorting I managed to get everything just the way I wanted it. I will have to test out the way I organized these drawers to see if it will definitely stay like this, but for now I have room to grow and like to have my items sorted nicely. The top drawer holds all my double sided tape, my corner cutter, a dancer punch, and all the little metal extenders that I have as spares. The second drawer holds my hole punch and all my specialty scissors. Next, I placed most of my stickers. These stickers range from winter to summer, birthdays to beach days, flowers to dancers. The fourth drawer is all my stickers for specific scrapbook projects. I plan on doing a scrapbook for Disney, so I have purchased a bunch of Disney and Florida stickers to use for this project. I also have stickers from other trips I've taken or will be taking, such as NYC and France. I wanted these stickers in a separate drawer so when I work on those particular projects I can find them easily. The first drawer with paper holds all my white paper since I use that more often than any other color. Then blue, purple and pink. The last paper drawer holds brown, grey and black. And the last drawer holds....NOTHING. Yes, I have room to grow! 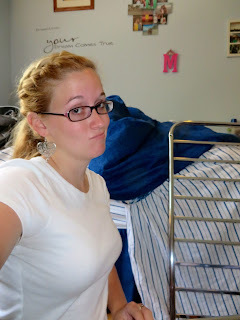 I left all my pictures and items to scrap inside the third basket. I think that system is working for me currently and I'm okay keeping it for now. So there it is, in all it's glory. 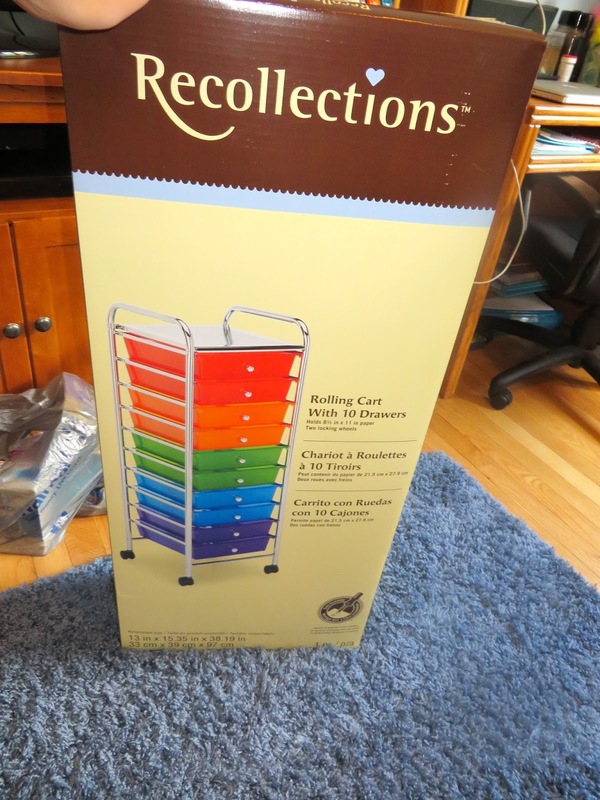 I placed it just inside my closet and can wheel it out to my desk anytime I'm ready to start scrapbooking. Also there will be less supplies on my desk when I scrapbook making it easier for me to keep working on projects. There will also be less clean up which is something that I greatly appreciate. I tend to shy away from scrapbooking when I don't have a ton of time because I don't want to take everything out to then put it away again, now I just have to roll the cart to my desk, scrapbook, and then roll it away when I'm done. Sounds good to me! Did you work on any organizing projects this weekend? What kind of crafting do you do? How do you organize your craft supplies? I would love to hear how you organize your supplies, please let me know in the comments!